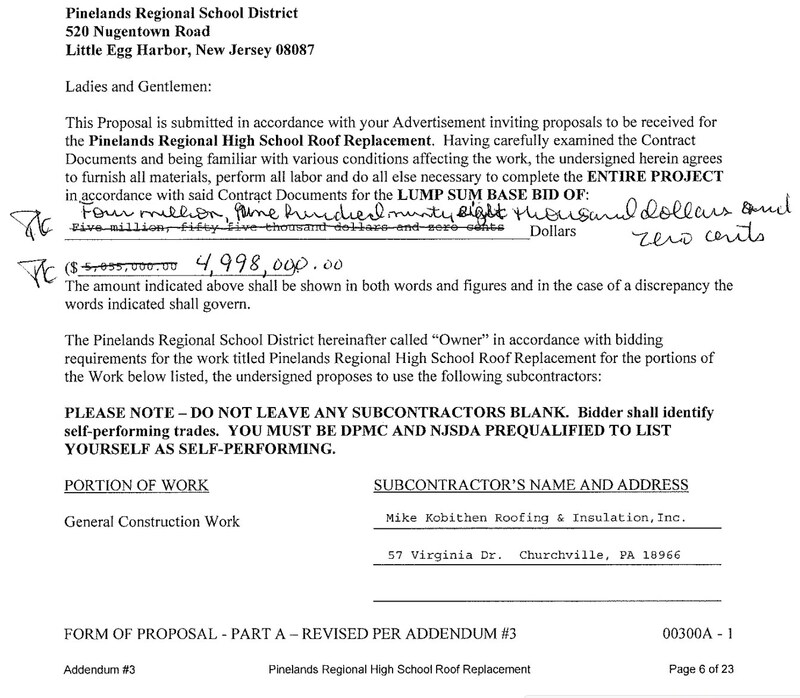 This article is a repository of all contracts for the 2017 Pinelands Regional High School roofing replacement project. It will be updated whenever new information is made available. UPDATE 1/5/2018: daily reports of been moved to its own article. 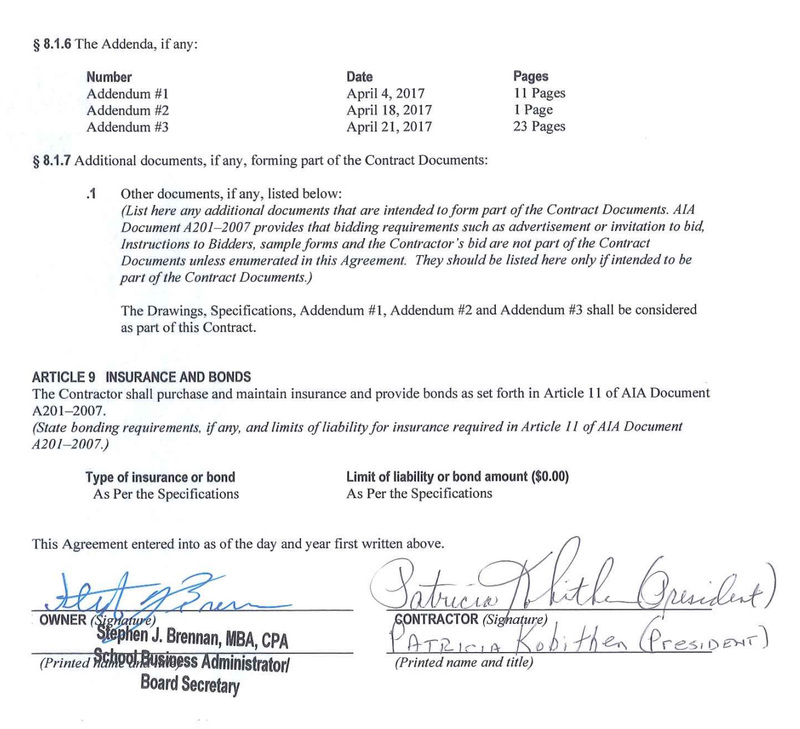 Pinelands-Kobithen contract: The 450-page contract between Pinelands Regional School District and Mike Kobithen Roofing and Insulation, Inc.
Downloads:OCR-d version (140 MB, its text can be searched, except the first 206 pages, unfortunately, for a reason I can’t figure out yet). Non-OCR-d version (37 MB). A directory containing the full OPRA request and response for this contract. The first 408 pages of this document contain the bid specifications and other supportive documents. Page 409 through the end contains the contract, which codifies the specifications. The contract was written by Garrison Architects, as a representative of the district. Garrison is not a signatory. see the below “Other contracts” section for the district’s contract with Garrison. The contract was signed on May 11, 2017 (page 403). The actual signatures are on page 410. The project start date was June 19th (404) and completion date is specified twice: in the specifications as August 18th (61) and in the contract as September 1st (404). “Liquidated damages” is also specified on page 404, as $2500 for every day the completion date is missed. Other contracts: Between the district and Garrison Architects, TTI Environmental, and Synatech, Inc. The OPRA request. Download non-searchable PDF (3.7 MB), text-searchable PDF (41 MB). The contract for Garrison starts on page two. For TTI, approximately on page 20, and for Synatech, page 54.